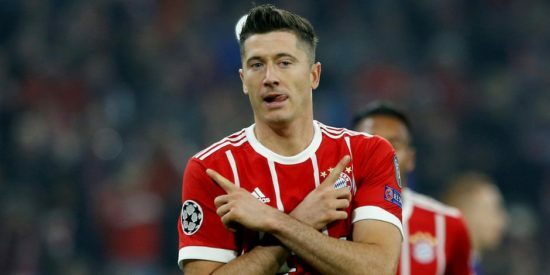 Manchester United are ready to make a move for Polish striker, Robert Lewandowski to add more firepower to the club’s attack, as reported by ESPN. The Bayern Munich hitman is open to the possibility of leaving Germany as he is ready for a new challenge. He had been linked to Real Madrid, but the European champions are looking at signing a younger player to spearhead the attack following the exit of Cristiano Ronaldo. Jose Mourinho is ready to make a move for the player, who could be an upgrade on Romelu Lukaku, who hit 27 goals in his debut campaign at Old Trafford. The Red Devils have monitored Lewandowski for a while and will test Bayern’s resolve in keeping the 29-year-old. Chelsea and Real Madrid are also interested in signing the player, though he will command a big fee. United have had a modest start to the transfer window and while the signings of Diogo Dalot and Fred are positive moves, more additions are needed to challenge City for the title. After an excellent start to last term, United lost form at crucial points of the campaign and ultimately fell 19 points behind City, who won the league comfortably. The fact that Arsenal and Liverpool have strengthened this summer while Chelsea with their new manager will be looking to make The Blues more formidable. Lewandowski is one of the best players in the world in the striking department and can guarantee close to 30 league goals should United go all out for him. He scored 41 goals in as many games he played for Bayern Last term – interesting numbers for a player who is said to be on a decline. Though he is nearly 30, his ability and consistency will be vital. He is a striker that is known for his technique, positioning and exceptional finishing. He joined Bayern in the summer of 2014 and has hit a stunning 151 goals in just 195 matches.